Is there any other item in a man’s wardrobe that has the same transformative power as a pair of sunglasses? Within seconds you can go from sad dad squinting over the barbecue, eyes watering from the sun and pollen, to smooth rock star preparing to take the Pyramid stage by storm. No matter how debonair they look, however, the main role of a pair of sunglasses is to protect your eyes from UV damage caused by the sun. If you’re wearing cheap plasticky styles because you’ve got form for sitting on them, bear in mind that your retinas are getting roasted. To shield them properly, look out for ‘CE’ or ‘ANSI’ marked on your shades – usually on one of the temples. This shows that the lenses comply with common standards by blocking out 95 per cent of UV rays below 380 nanometres (light is measured in nanometres with damaging UVB rays measuring between 320 and 390 nanometres). Materials matter. As a general rule, lens materials CR-39 (a plastic made from hard resin) and polycarbonate (a synthetic material) are lightweight but not particularly scratch-resistant, while glass lenses are heavier but better built to withstand the impact that leads to scratches forming. Similarly, plastic frames (including acetate) are lightweight and malleable but not as durable and corrosion-resistant as metal. Other details that mark a quality pair of shades apart from imposters include springs at the hinges to allow the arms to open wider when worn, and padding at the bridge so that they sit comfortably at the top of your nose. Aside from choosing a design that suits your face shape, the other buying consideration to remember is that if you’re planning on driving or spending time near the water, think about polarised lenses. “Polarised lenses reduce glare from reflective surfaces and [by extension reduce] eye fatigue,” says Andie White, frame buyer at MyOptique Group. All of the major fashion houses have a sideline in shades, while the market ranges from heritage brands like Ray-Ban and Persol, which have been there since the beginning, to hip independents like Mykita and Monokel. So while we peel our gaze away from the office screen and onto the shimmering sun coming in through the window, keep your peepers protected and put your eyes onto our list of the best sunglasses brands in the world. If you’re one of those people who by happenchance leaves their sunglasses/phone/life savings/family cat every time you get up from a chair at the pub then you might want to think about going for a budget pair of shades. No one does saving your pennies better than H&M on the high street. It covers most of the go-to styles of sunglasses, usually made out of plastic, so watch them in the melting sun – though it does have some premium options constructed from acetate, too. Despite the fabulous pun in their name, there ain’t nothing scary about the retro stylings of these sunnies. The British brand has built a cult following, largely down to the fact that the sunglasses are so readily available, and usually discounted on ASOS. It’s also built a strong network on social media with an Instagram chock-a-block with candid photos of influencers having fun with some of its outrageous shapes, embracing the fact that sunnies can be a little silly as well as UV sensible. Outfitting hipsters since 1970, Urban Outfitters is a department store selling all manner of vintage-inspired clothing and mini cacti (obviously). In terms of its garments, it runs a load of brands alongside its own products, but the range of sunglasses is almost exclusively own brand. You can pick up cheaper sunnies elsewhere on the high street, but the UO collection is a little more stylish, with plenty of tortoiseshell on offer. The frames can be a little flimsy, but they’ll certainly get you through that heavy Glasto weekender – fallow year permitting. Spanish eyewear company Hawkers is a relative newcomer in the war against summer squinting. Founded in 2013 and only available via its website, Hawkers has built its business through a burgeoning social media presence and glamorous lookbooks in oh-so-fancy locations like Positano and Capri in Italy. Its mantra is quality at value, and the polycarbonate frames are tough and durable. Style-wise the sunglasses are solid, if not particularly cutting edge, updating famous shapes like the Ray-Ban Wayfarer or the Oakley Frogskin and offering bold colours in the lens or frame. The monocle may have gone out of vogue some 200 years ago but its namesake, bar a missing and misplaced letter – Monokel – is currently one of the trendiest places to buy sunglasses. A Swedish unisex label, Monokel makes all of its frames from a recycled acetate. The look tends to be rounded, chunky and 1960s-influenced with lots of tortoise-shell, amber and green. A fine option if you want to spend some money but not on one of the obvious brands. The brand that brought us instant photography long before your phone packed a camera is also the one responsible for polarised lenses in sunglasses. Blocking glare and harmful UV zaps from the sun, Polaroid offers some of the best protection at prices you won’t want to shield your eyes from. Its frames skew classic with just the occasional flash of a coloured lens, if you like that kind of thing. Since it was founded in 2004, Quay has swiftly risen to become the ‘It girl’s’ choice of sun-protecting specs with ringing endorsements from Bella Hadid, Kylie Jenner and Paris Hilton. However this year, the Australian brand launched its first men’s collection because us ‘It boys’ care about our retinas too. The styles are not nearly as garish as that reputation may sound – usually updates on classic shapes at about a third of the price of the designers they reference. Once again, tortoiseshell is a favourite – those slow-moving reptiles are real trendsetters. 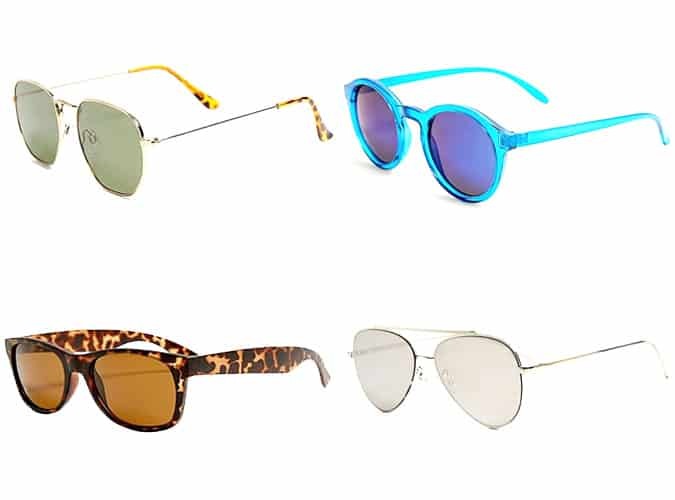 If the ladies of Coachella aren’t found in Quay, then they’re sure to be wearing a pair of Perverse sunglasses. Based in California, Perverse was founded by businesswoman Toni Ko who sold her first company NYX cosmetics to L’Oreal for a rumoured $500 million. Perverse shares the same affordable glamour factor as Ko’s earlier venture with the oversized shade dominating. It also sells as unisex so that you can go his and hers to Coachella if you so please. The brand ships internationally, and even with the added costs, comes in at a snip compared to its rivals. You couldn’t move in the 1990s without bumping into someone sporting a pair of Oakleys. The company had started out of the garage of founder James Jannard in 1975, originally making motorcycle grips, then moving into ski goggles before the release of its first sunglasses, the Factory Pilot Eyeshades in 1984. Keeping a sporty feel, these set the blueprint for the Oakley we know today. With its credentials on the slopes it’s no surprise then that most pairs offer polarised lenses to deflect unwanted glare (in fact performance vision really is the name of the game here). You wouldn’t wear many pairs to a summer wedding (we hope) but if you’re on the water this summer or driving in the sun, you can’t go wrong at this pricepoint. Is there any other company in fashion so synonymous with its product as Ray-Ban, which has been staring out the competition for more than 80 years? There are other brands, as this list can attest, but for a range of classic styles at a premium – but not too extortionate – price point, Ray-Ban sits on top. Originally designed to cut out the glare from the sun for US Air Force pilots in the 1930s, the world of Hollywood soon came calling. Marlon Brando wore aviators in The Wild One, The Blues Brothers famously wore Wayfarers, as did Audrey Hepburn in Breakfast at Tiffany’s, and Tim Roth wore the Clubmaster in Reservoir Dogs. The moral of the story is, if you want to look like a screen legend, Ray-Ban is the way to go. The only other label that can match Ray-Ban for its illustrious history is Persol, which was founded 20 years earlier in 1917. Meaning ‘for the sun’ in Italian, Persol pioneered its trademark yellow-brown lens in the 1920s when Ray-Ban was still in its gestation period. Later, where the Americans had James Dean, Persol had fellow counterculture icon Steve McQueen who wore the glasses in The Thomas Crown Affair. Persol also has the patent on the world’s first flexible stem system which allows for bend so its sleek frames can adapt to the shape of your face. Walking into the most recent Cubitts store on London’s Jermyn Street, you feel like you’re entering the atelier of some fine and extravagant jewellers. Your beachside tat seller this ain’t. As an optician first and foremost the brand offers free tests and prescription lenses, but its sunglasses are available without these lenses and don’t skimp on their top-level UV400 protection. Expect retro frames with a particular nod to the 1960s, all of which go through 50 stages of production with four separate stages of polishing. What do the fictional characters of Tyler Durden, Patrick Bateman and Vincent Chase from Entourage all have in common? Well, other than the wide berth you’d likely give them down a dark alleyway they have all been seen on screen sporting a pair of Oliver Peoples eyewear. The brand is Hollywood through and through, opening its first boutique on Sunset Boulevard in 1986. Its designs are vintage repurposed for the modern day and surprisingly unflashy for a Tinseltown brand. It also offers 100 percent UVA protection and seven-barrel hinges on the frames (most average sunglasses only have three), so they stand a greater chance of survival when you flop on the deckchair while they’re still in your back pocket. If Karl Lagerfeld jumped into a nuclear reactor and turned into a sunnies-designing rhombicosidodecahedron, we still don’t think the styles could match Mykita for sheer edginess. Based in Berlin (where else?) it’s been making eyewear since 2003 and can count collaborations with fellow hype brands Maison Margiela and Moncler on its CV. It has simpler designs in its stacked arsenal but if you’re going to spend £500 why not go for something on the Zoolander side of the spectrum – the Nita standing out for its unnerving similarities to the Birds Nest Stadium from the Beijing Olympics. It may be better known for its luxury pens and watches, but Montblanc’s eyewear range offers the same kind of dapper, globetrotting style the brand is known for. 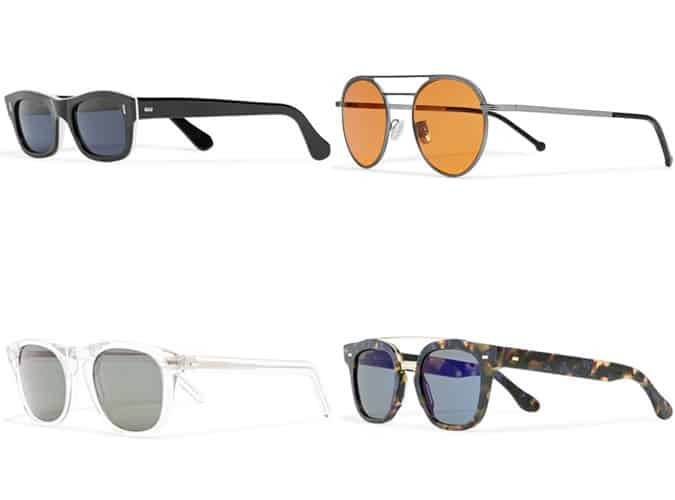 Made in Italy with eyewear specialists Marcolin (which produces sunglasses for fashion houses as diverse as Balenciaga and Timberland), it’s a classic, masculine range made up of timeless shapes and colours. If the sumptuous Tom Ford-directed film A Single Man taught us anything it’s that the man knows good eyewear. Of course, the ones Colin Firth sported in the film were clear, but pop in some darkened lenses and Tom Ford’s your uncle with a cinematic, 1960s influence that pervades the designer’s work (though this is another brand licensed by Marcolin). Alongside slimmer, more timeless frames Tom Ford also has humongous squared shapes if you want to go all-out VIP, while all the lenses are 100 percent UV protected. Culter and Gross is a British eyewear founded by, whoever would have guessed it, a man called Culter and a man called Gross, when they met at optometry school in London in the 1960s. In the last half-century, the brand has grown into one of the biggest in high fashion eyewear with regular appearances on catwalks around the four major fashion weeks. It even has its own museum. Alongside classic options, expect bold, angular designs in colours often brighter than you’d expect, and palladium frames – one of the rarest and most lustrous silvery-white metals. Plus the highest UV protection, of course.